In the Northern Hemisphere, it’s safe to say that Winter is well and truly here although in Spain, it’s actually really mild with lovely, clear sunny days and blue skies – what better way to banish the Winter Blues than spending time out here !! But anyway, we’re currently finalising our very first Recipe Book, The Balance Factor, so we thought we would share some inspiration for a Retreat favourite and a meal that will really warm you up from the inside, out !! It’s easy to prepare and can be frozen too !! In a large saucepan, lightly steam fry the vegetable stock cube, leeks, garlic, chili and parsley using a small amount of water until the leeks are soft and the stock cube has disolved. Add in the red peppers, paprika and pimento and mix together until well blended. Drain and rinse all beans and pour into the saucepan. Stir together until everything is coated with the leek and spice mixture. Pour in tinned tomatoes and tomato puree and mix together until mixed well. Pour in water, stir and allow to simmer for 15 minutes – the beans will thicken the mixture up the longer you simmer but as the beans are already pre-cooked, you don’t need to cook it for too long. Season to taste and mix through the lemon juice and cacao powder. Serve with cauliflower rice and fresh spinach and garnish with some chopped parsley. We allow it to cool and place it in the fridge for 24 hours to allow the flavors to blend together but this is entirely optional. How hot you want it is entirely up to you – we use 3 chilies to give it a nice blast of heat but not too harsh on the palette. 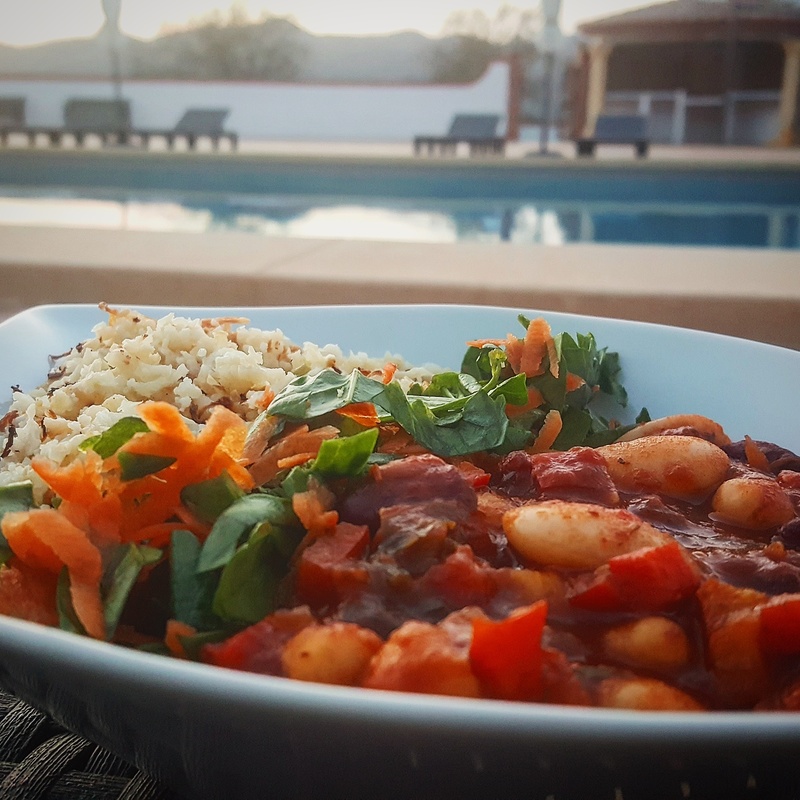 What beans you use is up to you – we like to use a few different ones when we prepare this dish as beans are a great way of keeping your protein levels up and giving you that comforting feeling too. For additional color and texture, you can mix in some diced red pepper and sweet corn just before serving. Want to make the traditional Chili Con Carne – simply substitute your “white beans” for some lean, ground beef and fry this up with the leek mixture before adding in your kidney beans and tomatoes. P.S. If you wanna come spend some time here with us to banish those Winter Blues, we currently have a few spaces left in January where we’ll be doing our Gourmet Fitness Weeks – simply email us to find out more and we’d love to see you there ! !